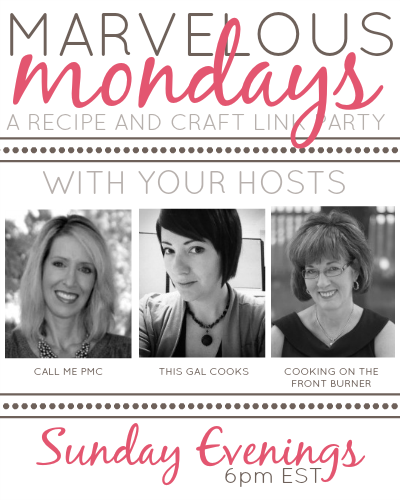 Good evening and welcome to Marvelous Mondays 94. How was your week? And more importantly, how was your weekend? Mine was pretty darn good. I got the test site link to my new blog design and I absolutely LOVE it. The new design should be rolling out soon. There are just a few revisions that need to be made first and then it will be good to go. This gal is E-X-C-I-T-E-D! 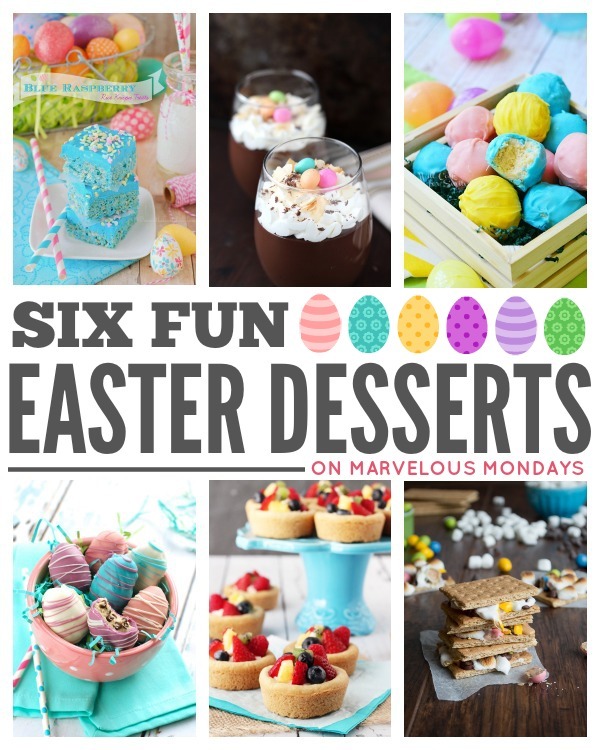 Since Easter is next weekend, I thought I’d feature a few drool-worthy Easter desserts from last week. Find the links to the recipes below the collage. 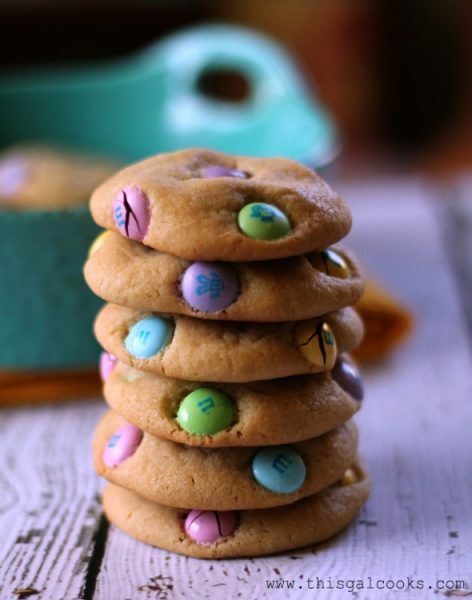 Last year I made some Easter M&M Cookies that were quite the hit at home and work. Want to try them? Click the image below for the recipe. You can catch more of my features on Pinterest and a few on Google Plus, Facebook and Twitter. To keep up with all of the tasty recipes and features from This Gal Cooks, you can easily follow along via my social media links below. Support other bloggers – Please visit at least two other links at this party. Link up recipes, DIY projects, crafts, printables and tutorials. NO GIVEAWAYS or shops, please. They will be removed. Please note that by linking up your posts and projects, you are giving This Gal Cooks, Cooking on the Front Burner and Call Me PMc permission to use your photos in the featured posts and on social media outlets. All photos will be linked back to your sites and respective posts. Please link up only new content or content that you have not shared at this party in a while. I can’t wait to see the new blog design! Who is designing it? Hi Beth! Heather from Viva la Violette is doing the design. I’ve always really liked your design but I am excited for you and looking forward to your big reveal of a new site design. So glad you love it!! Thank you, Holly! I’m so excited about the new design. I’ve always wanted to have my search, contact and social media stuff in the header but I could never figure out how to get it just right. I’m looking forward to rolling it all out soon. Have a lovely week and thanks for stopping by! Thanks for hosting! I’m sharing my favorite recipes for kid-friendly stuffed muffins and tomato onion jam. Thanks for the party Julie and have a great week! Thank you for the feature and for another great party, Julie! I bet you are so excited about the new site! Can’t wait to see it! Thanks for hosting! Pingback: Gluten Free Yummy! Why Sugar is Toxic - Gluten Free Yummy! Julie, Thanks for hosting a great party :) Have a great week! Thanks for another fabulous party Julie! Hi Julie! Thanks so much to you and the ladies for hosting – hope your weekend was good and have a fantastic week! Thanks for the party, Julie. Have a great week in blogland! Thanks so much for hosting, Julie! Hope you have a wonderful week! Thanks for the party and have a nice week! Thanks for hosting the party! Happy Easter! So, not only do I find out you make amazing brownies, actually tweet conversations, have the cutest blog ever (if the new one is better than this one, then wow, it is going to be amazing!) but you host amazing parties as well! Thanks so much for hosting and have a great week, Julie! Aww thank you, Mary! Welcome to the party! We are glad you joined this week. :) Have a lovely week! Can’t wait to see your new design. Thanks so much for hosting, Julie. Have a great week! Thank you for hosting, awesome party !!! Thanks for hosting and for the feature! Cute roundup. You’re welcome! Thanks so much for stopping by! This is my first time visiting. Thanks for hosting and great to meet you. Love your blog.